As people age, they tend to retire from jobs, which lessens the amount of time they interact with others. Friends and family may become ill or move away to live closer to other family members. This natural progression means that social stimulation can be significantly reduced as we age, which can have a negative impact on health: physical and mental. 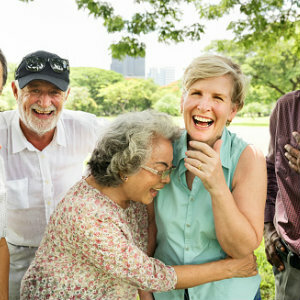 Here are some tips for how to stay social as you age. Researchers use a term, “social capital,” that encapsulates social ties that help us to connect, to build trust in one another, and to participate in activities together. Having a greater amount of social capital is beneficial, with one study showing how increased social capital correlated with positive health-related behaviors. Specifically, the study showed that people who were the recipients of a higher amount of social capital were 10 to 22 percent more likely to go for health screenings, which facilitates earlier diagnoses/more ability for treatment for serious diseases. One researcher at the Rush Alzheimer’s Disease Center compared how social activity affects cognitive decline. His discovery? That people who regularly interact socially show 70 percent less cognitive decline. In another study, the same researcher found that people who participate in more regular social activity had lower levels of disabilities in multiple ways: 43 percent less. One huge benefit of lesser levels of disability: these older adults will likely be able to live independently longer. You can spend more time with your spouse, your children, your grandchildren and your neighbors. Join groups, whether it’s a book club or a hiking club – or something else entirely. And, one more tip: if you have dreamed of moving somewhere else, realize how this can lead to isolation in your new community. Would you be better off staying in a familiar place where you already have friends? HuffingtonPost.com shares another idea: participate on social media. You can chat with people even when you’re stuck in the house, perhaps because of wintry weather or because you sprained your ankle and don’t want to drive until it heals. Use Facebook to share what you’re up to or sign up for a Skype account to talk to your grandchildren around the country. Social media can bridge geographical gaps, allow you to reconnect with old friends and otherwise reduce a sense of isolation or loneliness. If you don’t know how to use a social media channel, look for classes at your local library or senior center. The class will provide a social outing, and then you can expand your reach online. Socialize! Seriously. It’s good for you.